In one of Charlie Chaplin’s most famous movies, The Great Dictator, Chaplin plays a parody of Adolf Hitler. The film came out in 1940 and was one of the first major satires of the infamous German leader. The Great Dictator is one of the funniest and best comedies ever made. 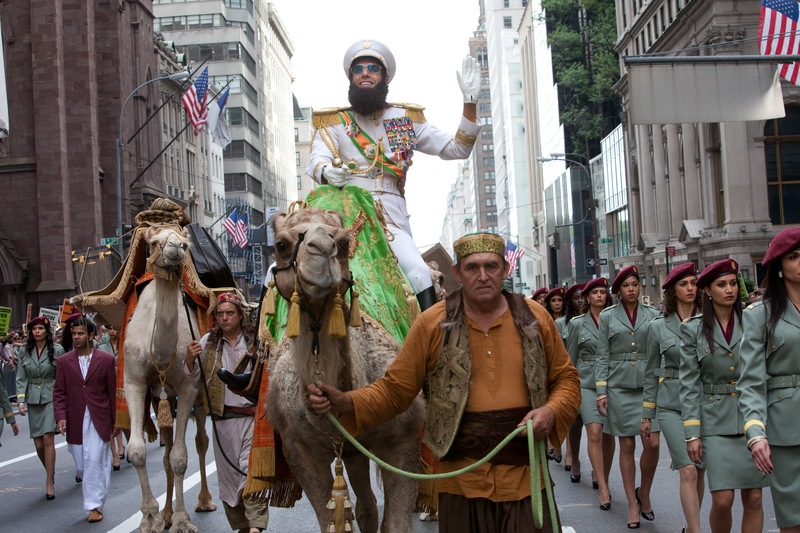 The Dictator, Sacha Baron Cohen’s newest film, is a little bit like an update for The Great Dictator. Cohen plays General Aladeen, leader of the fictional North African country Wadiya. Aladeen is a parody of dictators such as Saddam Hussein, Gaddafi, and Kim-Jong Il (who the movie is made “in loving memory of”). My main concern of The Dictator before I saw it was that it is a scripted film. Sacha Baron Cohen works best on improv. And after seeing this, I still think he does. But The Dictator is such a funny movie that it is easy to still enjoy. The world cannot stand Aladeen’s rule anymore, and demand that he goes to New York City to meet with the United Nations. When Aladeen goes, his righthand man Tahir (Ben Kingsley), who is the rightful heir to the Wadiya throne, hires an extremely xenophobic security guard (John C. Reilly) to get rid of Aladeen. Aladeen ends up with his beard shaven and is stranded in New York. Tahir, meanwhile, has hired Aladeen’s idiotic double (also played by Cohen) to pretend to be him so Wadiya can form a democracy. Aladeen ends up working for Zoey (Anna Faris), an uber-liberal who runs a health store. Aladeen later encounters his old nuclear scientist he thought he had executed, Nadal (Jason Mantzoukas), who becomes Aladeen’s sidekick in the film. The main plot is that Aladeen tries to take back his throne so he can prevent Wadiya from becoming a democracy. In the movie, there are jokes about terrorism, 9/11, Osama BinLaden, the Olympics at Munich, child soldiers, and many more. Aladeen shares traits from his other character Borat, such as his anti-Semmitism, sexism, and racism. But compared to Borat, Aladeen is Ned Flanders. He’s the nicest character Cohen has made (and the first since Da Ali G Show), and in the film Aladeen falls in love with Zoey when she starts yelling at a cop who arrests Aladeen. The love story feels a little forced in the film, but is fine nonetheless. But how does The Dictator stack up to Cohen’s other films? I’d say it’s better than Bruno, but not as strong as Cohen’s best work Borat. But still, The Dictator is a hilarious film that I recommend to any Cohen fans. The director Larry Charles, who has also made Borat and Bruno with Cohen and has worked on Seinfeld and Curb Your Enthusiasm, supplies the comic style in Cohen’s usual films plus the sort of zaniness seen in traditional comedies. The story is the weakest part of the film, but that’s easy to overlook. Oh yeah, Cohen has promoted the film in his Aladeen character, and has joked to get positive reviews for the film he tortured critics such as Roger Ebert and A. O. Scott. I’m giving this film a positive word, but let me just tell you I wasn’t. Great post. I had no interest in seeing this film prior to reading your review. How would you like it compared the The Great Dictator? Well, it’s no contest that The Great Dictator is a better movie. Still, The Dictator is very funny and is better than most comedies today.